This very pretty, well put together bay filly impressed us with her kind demeanor, strong shoulder, pretty head, and very nice, light, toe pointing movement. That’s a lot to like! 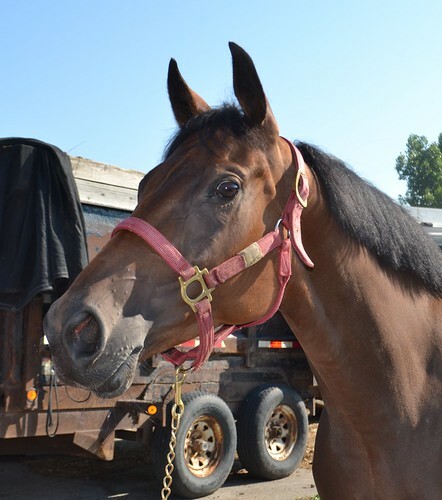 Icy has won three races, including one this spring, so she has had to face tougher competition where she hasn’t been as competitive, so her trainer wants her to find a new career. Icy is described as sound, as we saw nice clean legs. She is reported to be a good girl to handle and work with, and has no vices. Icy was polite and friendly for her photos session, and showed a loose and light trot with good reach. We think she has unlimited potential for any discipline, but with her pretty head, solid bone, and nice movement, we can see the show hunter ring, or eventing in her future. She is by AP Warrior, who is a son of AP Indy out of a Quiet American mare, and her dam is Miss Icicle by Charlie Barley (a son of Affirmed) . 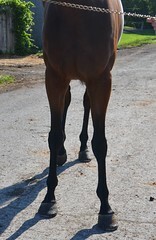 We think Icy is a lovely prospect and she is offered at an enticing bargain price.